... By the sheer sea of white covering every settlement, plant or animal around, by the Christmassy magic that overpowers the entire resort and by the lively yet peaceful atmosphere that surrounds you here. However, being a lover of culture, I wanted to delve deeper into the Lappish magic and find out a little more about the area behind the festivity and tourism. Europe’s only indigenous people, the Sami, are very spiritual folk, who have fascinating traditions, rituals and folklores. They believe that everything has a soul – plants, animals and objects included. They have magical explanations for the Northern Lights, using the wildlife and nature around them to explain this beautiful natural phenomenon, which is both feared and respected as they believe it is the awakening of the spirits sending messages to the living. They rely on nature a lot to survive and to explain the weird and wonderful happenings of Lapland, for example the Sami believe that the colour of the Autumn leaves – “Ruska” evokes feelings of peace and harmony before succumbing to the harsh cold of the glistening winter months. The return of sunlight in Spring awakens the beautiful landscape and fills all beings with the joy of life as a reward for surviving the winter. 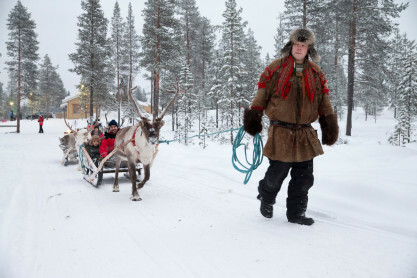 The Sami also rely heavily on Reindeer herding, for food and for business, as these magical creatures outnumber people in Lapland. A local Sami told me that the way to differentiate between the sexes of the reindeer is by their antlers. Female reindeer shed their antlers in December ready for winter, whereas the male reindeer keep theirs through till spring, when they shed theirs. Reindeer are also a delicacy here in Lapland, you will most certainly find them on most menus, if you’re feeling adventurous enough to try it, do so as it is delicious! And there’s always Rudolph’s Reindeer Run! 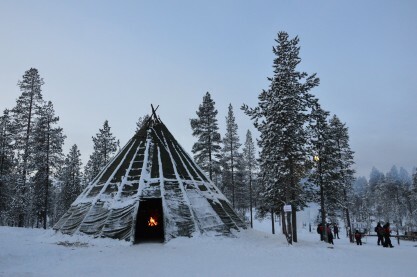 A “Kota” is a Lappish Hut, similar to a tipi, which was originally used to heal. Lappish medicine men contacted spirits through the hole in the top of a Kota to heal the wounded. Here in Lapland now, you will usually find refreshing hot berry juice, ginger cookies and a warm fire – I guess this is a more conventional way of healing oneself from the crisp cold! One of the most fascinating things about Lapland is the changing climate. In winter expect an average of 4.5 hours of daylight, sandwiched between hours of twilight or darkness. This only enhances the whole experience, as the colours of the sky range through a mixture of icy to midnight blues, hones of terracotta and crimson, pretty pinks and if you’re lucky enough – emerald greens! There’s nothing more satisfyingly festive than wrapping up warm in minus 10°c, and sledging home in the glistening twilight. In the summer months, daylight suppresses the night and banishes darkness to a measly 4 hours a day, and even sometimes overpowers all darkness to allow for the midnight sun to loom over the melted evergreen forests. 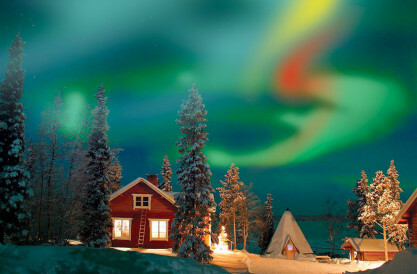 Lapland is like a treasure chest of mythical magic, the deeper you dive, the more you discover. Dare to delve into the wonders behind the wonderland. Search for Holiday availability here.